Perhaps you’ve used QuickBooks 2014’s Basic Customization dialog box to make some changes to your invoice’s appearance, and you haven’t been satisfied. Maybe you’ve gone the extra mile and noodled around with the Additional Customization dialog box to make further changes, and maybe even that hasn’t left you happy with the appearance of your invoice. Do you have any additional recourse? Are you stuck with an invoice that doesn’t look right or that doesn’t work for your organization? Heck, no! 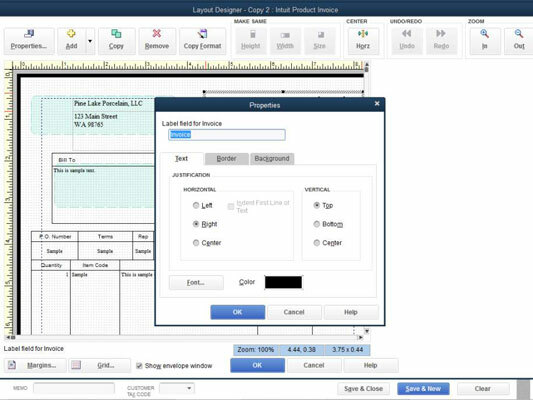 If you click the Layout Designer button, which is available in both the Basic Customization and Additional Customization dialog boxes, QuickBooks displays the Layout Designer window. 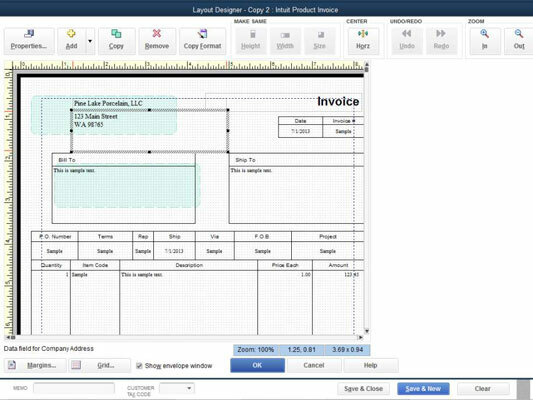 The Layout Designer window lets you move invoice information around on the actual printed invoice. Your best bet for finding out how to work with the Layout Designer tool is to experiment with it. You can create an example invoice form template — something you don’t really care about — and then use this new invoice form template for some goofing around. Moving and resizing objects: You can move and resize objects on the form pretty easily. To move some bit of the form, first select the bit by clicking it. Then use the arrow keys or drag the mouse to move the selected bit. You can resize the selected bit in a similar way. You can select the Show Envelope Window check box to have QuickBooks draw envelope windows on the invoice form to show you where these appear. You want to have envelope windows shown to make sure that your customized invoice still has its address information showing through. You can click the Grid button to display the Grid and Snap Settings dialog box. This dialog box provides two check boxes where you can indicate whether QuickBooks should use a grid (those are the dots you see) to more accurately line up invoice objects on the form. The Grid and Snap Settings dialog box also includes a Snap To Grid box so you can tell QuickBooks that it should make gridlines sticky. Sticky gridlines automatically attract invoice objects so that you can more easily line up the objects against the gridlines. The Grid and Snap Settings dialog box also includes a Grid Spacing box that you can use to specify how wide or narrow QuickBooks should draw gridlines. Selecting objects: You can select multiple objects on the invoice by dragging the mouse. To do so, click at a point above the top-leftmost object that you want to select, and drag the mouse to a point that is just below the bottom-rightmost object that you want to select. As you drag the mouse from one corner to the other, QuickBooks draws a rectangle. Any object that’s inside this rectangle when you release the mouse gets selected. Resizing multiple objects: You can change the height, width, and size of multiple selected objects by clicking the Make Same Width, Make Same Height, and Make Same Size buttons. To use these Make Same buttons, you first select the objects that you want to make the same. Changing column widths: You can change the width of columns in the column area of the invoice form by clicking the Column object. After you do this and QuickBooks selects the columns area, drag the column divider line left or right to resize the column. Note that if you make column 1 narrower, QuickBooks makes column 2 wider to take up the space. Also note that you can resize the entire column area in the manner described in the preceding point. Positioning text within fields: If you click an invoice object and then click the Properties button, QuickBooks displays the Properties dialog box. The Properties dialog box includes a Text tab that lets you specify how text should appear within an invoice object area. The Properties dialog box also includes a Border tab that lets you specify whether QuickBooks should draw a border along the edges of the invoice object. Changing fonts: You can change the font used for the selected object by clicking the Properties button, clicking the Text tab of the Properties dialog box, and then clicking the Font button that appears on this tab. QuickBooks displays the Example dialog box. The Example dialog box lets you choose a font; font style; a point size; and special effects, such as strikeout, underlining, and color. Adjusting margins: If you click the Margins button, QuickBooks displays the Margins dialog box (not shown), which includes Top, Bottom, Left, and Right text boxes that you use to specify the margin around the invoice. The default or initial margin settings equal half an inch. Center a selected object on an invoice form by clicking the Center button to activate the Layout Designer. You can click the Zoom In and Zoom Out buttons to see more or less detail. If you want to undo your most recent change, click Undo, or click the Redo button to undo your last undo option. After you use the Layout Designer to make whatever changes are appropriate to your new invoice form template, click OK to save your changes.